Today, thousands of employees across Viacom and its brands pause from their work week and join together to make a difference in our communities around the world. 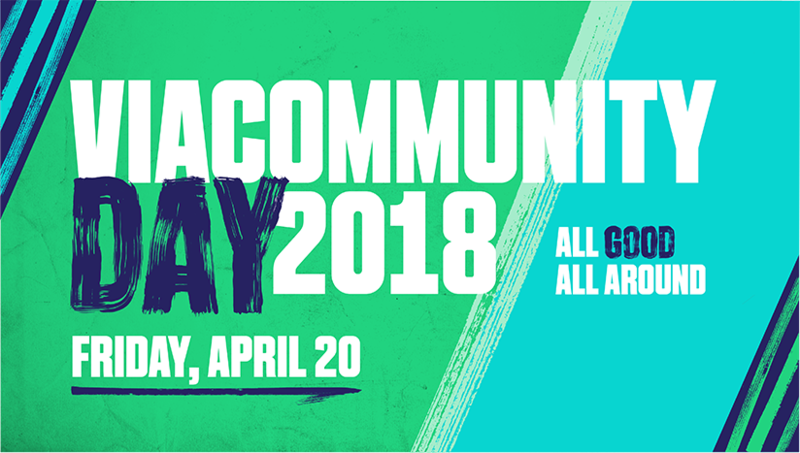 Viacommunity Day 2018, now in its 22nd year, puts the full weight of the company behind social causes through volunteerism led in partnership with non-profit and civic advocates. With employees in 25 countries participating, it’s a truly global tradition, underscored by this year’s theme of All Good All Around. To celebrate Viacommunity Day, employees will take part in a wide variety of charitable activities, from educating young people and providing professional legal guidance to beautifying public spaces and assisting those in need, among other acts of giving. Viacom and its partners have organized more than 125 projects worldwide. To get updates about Viacommunity Day 2018, follow #ViacommunityDay on Twitter and Instagram. Argentina – Telefe employees will assist home for seniors Portal de Vida and non-profit Desde tu Lugar to plant vegetable gardens, paint and refurbish homes and provide company and entertainment for residents. Sydney, Australia – VIMN will contribute to a range of projects, preparing meals and birthing kits, assisting in fundraising efforts for AIDS and HIV research, and focusing on bush regeneration within Middle Head National Park. Los Angeles, California – Volunteers from Paramount Pictures have partnered with Chrysalis, a non-profit organization working in support of low-income and homeless individuals, to conduct job mock interviews and provide other employment skills training. Budapest, Hungary – Viacom has teamed up with the The Pető Institute, a therapy center for children with cerebral palsy, to beautify their living space and assemble care packages for patients. Toyko, Japan – Our team will be working to translate Japanese picture books to be sent to children in refugee camps. New York, New York – Viacom will join community leaders and residents of City Island in the Bronx on a series of restoration projects to refurbish its downtown and rekindle the Island’s rich nautical history, in partnership with the City Island Nautical Museum. Nashville, Tennessee – The CMT office is engaging with a number of community groups, including the Oasis Center, the Nashville Food Project and the Nashville Humane Association. Employees will provide assistance to at-risk homeless youth and animal care, among other activities.